How (and why) you should tell your brand's story. Storytelling may be a marketing buzzword, but there is actual science behind why it’s a powerful tool your brand should be utilizing. Research has indicated that our brains respond to the descriptive power of a story. 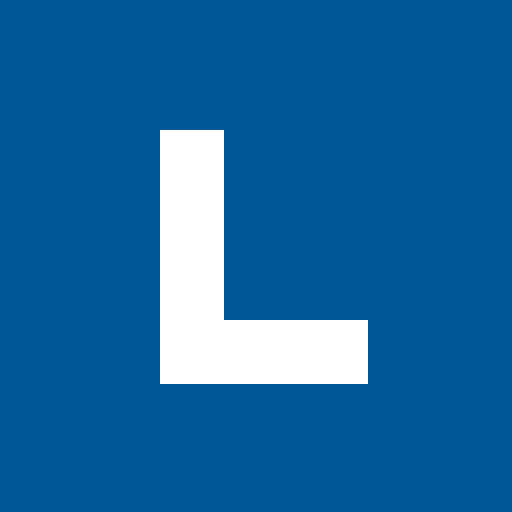 We process traditional marketing—i.e. "9 out of 10 dentists recommend..."—as facts, but a story produces a feeling that is proven to create a synchronization between the reader and the author. It inspires trust—and people buy from companies they trust. The best brand stories create a personal connection between the audience and the brand. They leverage emotion, build the brand’s authority, and can even build community. In this post, we’ve highlighted some brands—both B2B and B2C—that are doing an amazing job of utilizing brand storytelling, and broken down exactly what it is that works so well for them. When you are creating content with a storytelling focus, let SEO and industry jargon take a back seat. People are savvy, and they don't want to be sold to. Instead, you have to engage with them. Talk to your customers the way you would talk to them in person. and other quirky pop culture references. 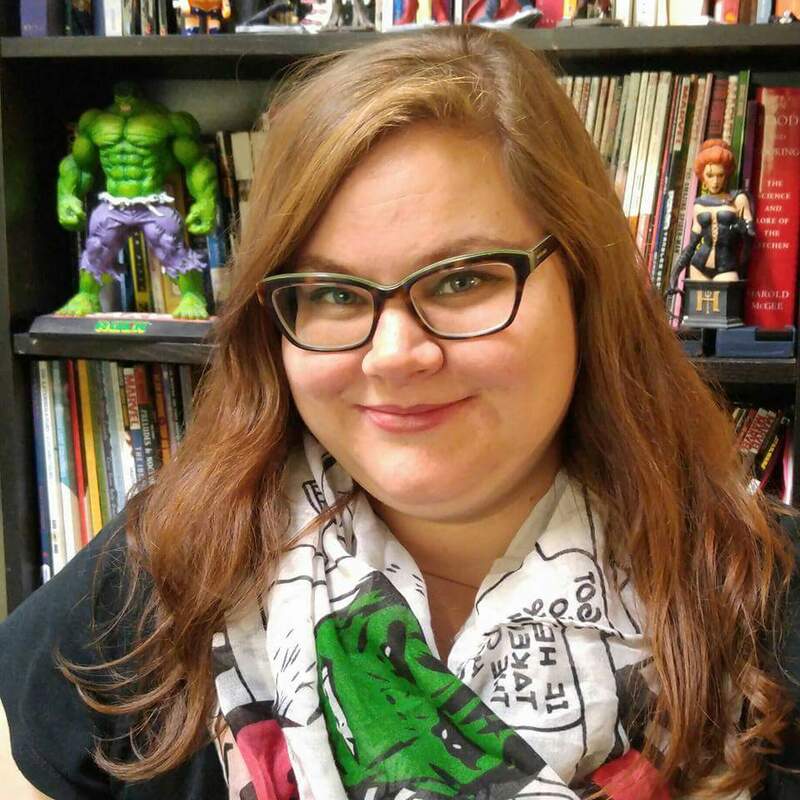 By speaking their customers’ “language” they establish authority, earn trust, and the all important “geek cred”. And, I admit, B2B brands have a much harder time with authenticity. They don’t always have the opportunity to be as funny or edgy as their B2C counterparts, but that doesn’t mean they can't feel authentic. Mailchimp does a great job balancing their need for direct, instructional text with a bit of levity. After you’ve set up your newsletter to your entire mailing list, meticulously checked your copy, and debugged your code, it’s pretty satisfying to high-five the Mailchimp. Mailchimp takes their voice and tone so seriously that they've set up a standalone site—voiceandtone.com—to host their impressively thorough style guide. What Mailchimp and other successful B2B storytellers do is put themselves in their customer's shoes—it's stressful to send a newsletter, and Mailchimp has got your back. Unlike fact-based traditional marketing, stories have a beginning, middle, and an end. When thinking about storytelling, think of your content in the context of a classic three-act structure. Act 1: The setup. Who is your customer? What is happening in their world? Act 2: The confrontation. Introduce the trials and tribulations your customer goes through because of the big problem in their life—the problem that your product just happens to solve. Act 3: The resolution. After setting up the character and conflict, introduce your product as the solution to the problem. This promo from Noodle Live nicely follows the three-act structure. It introduces a sympathetic character, puts him through a series of conflicts that help define the problem, and then introduces Noodle Live to create the resolution (spoiler alert: it's not about noodles). Protip: don't hog the spotlight. Salesforce makes the customer the hero of the three act story in their case study “Western Union moves money for better with Salesforce”. Note that Salesforce is the supporting character and Western Union is the star, even though the case study was produced by Salesforce. Brand personality reinforces your authenticity. Take a look at Beardbrand's website. It feels more like you are visiting a beard appreciation site than an e-commerce site. Their love of facial hair promotes brand trust (look at all that glorious beard art! They must know what they are talking about!) and creates an emotional connection with their hirsute audience. For a story to be successful, it has to tell the journey of a character the audience can relate to and root for. You've probably already created characters for your brand in the form of customer personas. While personas are a great framework for storytelling work, you don’t have to rely on them as the only characters telling your brand’s story. The stars of your story can be your employees, your customers, or even a fictional character created by your creative team (lookin’ at you, Old Spice Guy). GE and Johnsonville have both incorporated employees into storytelling campaigns. GE’s “What's the Matter with Owen?” campaign ran for more than a year and followed fictional GE new-hire Owen as he struggled to explain what it is he does in his new job. The campaign had the unexpected benefit of increasing job application submissions at GE, who created a new campaign called “The world is catching up with Owen” to match their real-world experience. Not only did the campaign increase employment applications, it fostered good will towards GE by showcasing a smart guy just trying to brag a little about his new gig to skeptical friends and family. Owen was a character the audience could relate to. Johnsonville Sausage asked their employees to come up with commercial ideas—and then actually created them. The zany charm—and backstory—make the Johnsonville ads feel like love letters to the brand from the people closest to it. If it's appropriate for your product and brand, ask your customers for reviews, feedback, and case study interviews to give you the raw material for your storytelling. Create a completely fictional character to tell your brand’s story. Remember the Maytag repair man? At a time when all major appliances had reached the pinnacle of technology, the character was introduced to help differentiate Maytag as the most reliable brand. Ol’ Lonely (did you know he had a name?) was the perpetually bored Maytag repairman who never had anything to repair. The character was introduced in 1967 and was so successful in helping tell Maytag’s story that he’s become part of it. Other companies that have created fictional characters to tell their story? KFC, who turned the real-life Colonel Sanders into a series of amusing caricatures bringing their brand into the modern era and Allstate, who created Mayhem, a personified version of all the bad things that Allstate can protect you from. You’ve crafted an authentic brand voice, created relatable characters, and infused personality into your new storytelling content. How are you going to get your customers to experience it? You want to make sure that you are delivering your brand story in multiple formats across multiple channels. By implementing different methods of storytelling throughout your website, you can create an immersive brand experience without the customer ever having to leave. 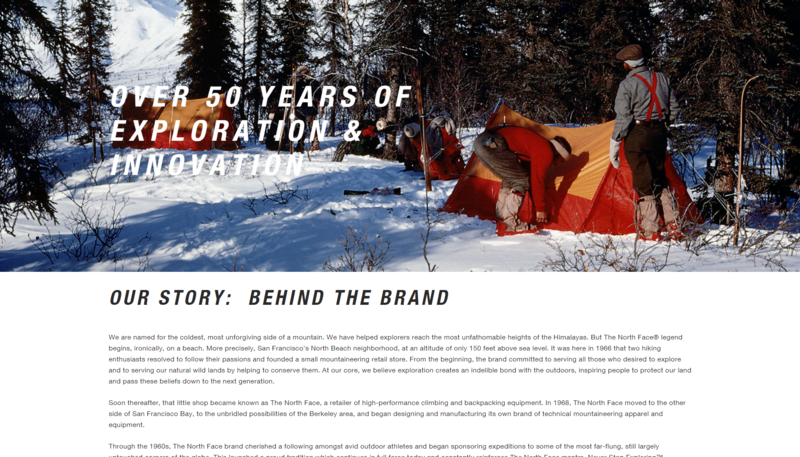 The North Face has infused their entire site with brand storytelling. They've dedicated a section to their brand story and a section about corporate responsibility. There are pages on expeditions they sponsor and their philanthropic work. It’s all surrounded by beautiful pictures of outdoor adventures. With all of these elements contributing to their story, they could take all of their product listings down, and you’d still know what The North Face is all about. 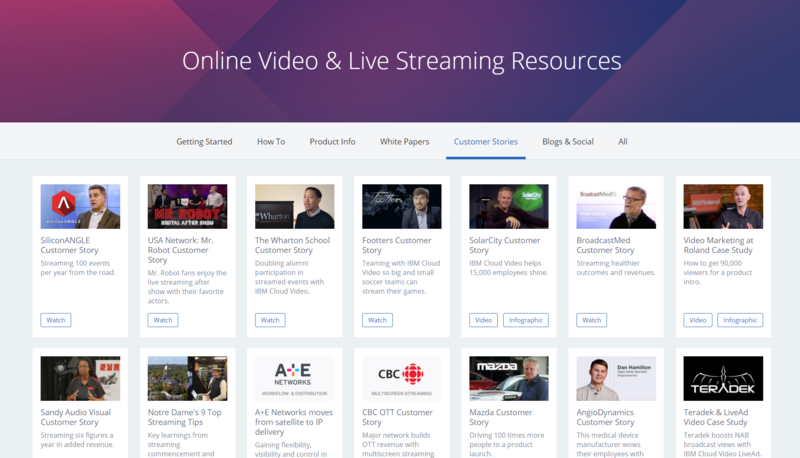 IBM Cloud Video (formerly UStream) provides case studies and customer stories in various forms on their website. Want to learn how NASA’s JPL used their product? Download the case study PDF. Want to see how a medical device manufacturer used it? There’s an infographic. How about SolarCity? Watch the video testimonial. By incorporating different types of media, IBM Cloud Video offers many ways to engage with the way they’ve helped their customers. The rise of social media is one of the factors that has driven demand for authenticity and storytelling, so it makes sense to utilize social media platforms to extend your brand storytelling capabilities. 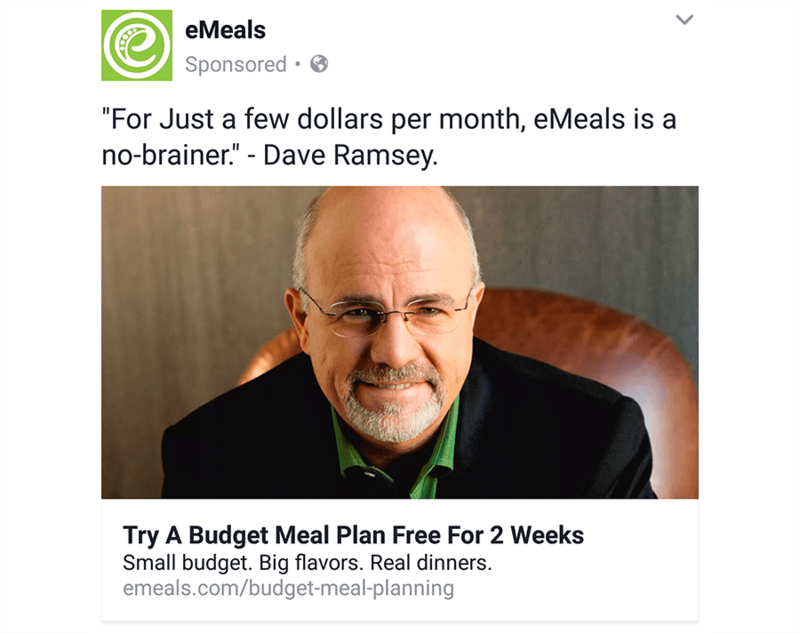 Emeals (a customer of ours) uses promoted posts that feature an endorsement from budget guru Dave Ramsey. These ads work to strengthen the brand’s “The way smart families do dinner” story. Using an endorsement that’s in-line with their brand story also serves to ease customer friction around pricing. Maresk, the world’s largest shipping container company is a B2B business that is taking advantage of social media to spread its story. With a presence on multiple channels (with their largest engagements on Facebook, Twitter and Instagram), Maresk uses photography, retweets from their employees, and stories about current events—including transparent reporting on negative events, like the time a Maresk ship to hit a whale—to engage with their audience in a meaningful way. They have done a masterful job of turning a “boring” B2B business into a compelling storytelling machine. Real stories are told over and over again and they keep connecting with people. Find the human element, define the "hero" in your story, and craft stories that engage and inspire. If your story resonates with your customers, they’ll want to be a part of it.